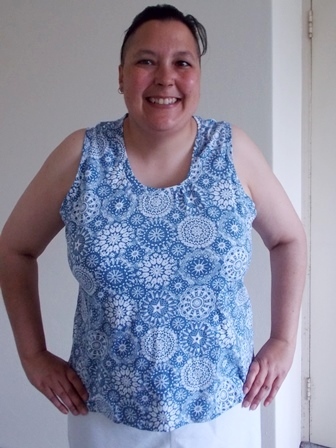 This top is another from A Beginner’s Guide To Sewing With Knitted Fabrics. I made this a couple of months ago and have made nearly all the patterns in the book now so I can’t remember which order I made it in. 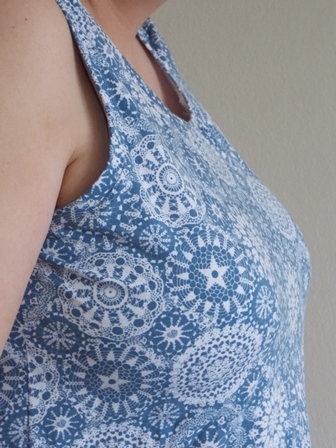 This top is incredibly simple to make. It is a basic front, back, bands around the neck / arms and bottom hem. If you were a super speedy sewing master you could get this easily done in a couple of hours if that. 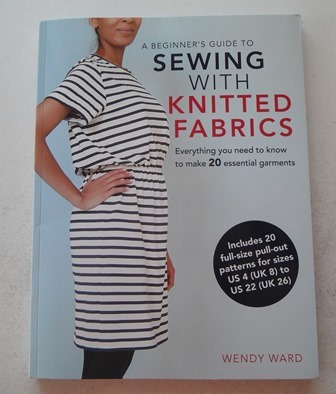 If you were a beginner and wanting to pick a pattern to start on from the book I would recommend this top. Fit wise I am pretty happy with it. I did make the largest size as I need to with all the top patterns in this book. The back is gaping a little but not enough to bother me. Perhaps I may take out some from the back next time but the fabric is a cotton knit so it more forgiving and less noticeable than other recent top patterns where I have had that issue. My sewing is a little bit dodgy around the bands on the neckline and one arm. I didn’t hand tack my fabric before attaching the bands on the overlocker so I did have to go over them in parts to correct bits I missed and my machine ate some of the bands in the process. I am lucky due to the nature of this fabric I can get away with as the print is busy. This is a great essential little top. You could wear it under jackets or layer it under dresses, in summer this would look cute under a York Pinafore. I think it would make a great gym top, the neckline is high so you’re not exposing yourself as you bend forward. The side of top goes up nice and high under the arm so again you don’t have any side expose. It is not too high under the arms or around the neck that you feel uncomfortable or that it is choking you. I am very tempted to now make one in a black cotton lycra for summer gym sessions with my trainer when I am finding the peak t-shirt I made earlier this year and have been wearing to the gym to be a little bit hot and boxy in the warmer weather. I have no problem wearing a fitted top the gym as I am there to work out and not be a fashion show so as long as I am comfortable I don’t care what I wear. The fabric used was leftover in my stash from when I made my skirt a couple of years ago, at the time I thought I would like to make a simple top with it so I could have entire outfit but in my cupboard it went and I forgot about it until I was “playing” in my stash one day and found it. I had just enough fabric left to squeeze this top out and that was with making the largest size. I really did fall in love with the print of this fabric when I first saw it. To be honest I haven’t really worn my skirt since I made it. No particular reason I just put it in my drawer and forget what I have made. Now that I have a matching top I think I will wear it more this summer. I can wear it to work as an outfit even though I will be wearing my work jumper over it because you will see a peak of the neckline under my jumper. It is super comfortable due to the fabric so ticking the comfort and natural fibre points. The style is very much a classic tank top that can go with any skirt so ticking that point. The fabric is a little different, pretty but in a non girly pink way so I think it ticks the creative/quirky point. I am super happy with this top. 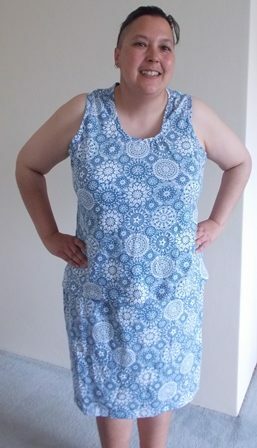 Not only did I make another pattern from the book which I aim to sew my way through but I also made a top from fabric I had set aside waiting for the perfect pattern (ok and forgetting about) Sewing and decluttering working as one and giving me a fantastic outfit.